They’re not quite Gr-r-reat. But maybe they kinda are? In what has become an almost yearly autumn tradition wherein I test (or torture, depending on who you ask) the functionality of my taste buds, I have once again succumbed to buying a product with the words “Pumpkin Spice” on it. Previous years have proved as expected. In 2015, pumpkin spice cheerios have become a distant memory but not a particularly fond one. 2016's Pumpkin Spice peeps were horrid enough to make me shy away from seeking punishment on store shelves during last year’s seasonal offerings. Unless I’ve blacked out a memory of something worse. Who can say? This year, as hard as it is to believe, I actually cringed when I saw the box of Pumpkin Spice Frosted Flakes. It’s not often I will recoil at a pumpkin spice product—the risks are always implied. In this case, I figured I knew all the hell that awaited: frosted flakes can be cloyingly sweet—they’re not nearly as good as you remember from your childhood—even with the reduced sugar the recipe has implemented over the years. They’re somewhat disappointing now: a great idea of pure blissful sugary content that in reality is just a soggy mess of sweetness washed away into your bowl once the milk hits the flakes. It leaves the flakes with an odd, smooth texture with an overly processed taste. The much better option, as I’ve learned over the years, is the more simple, dullard one: buy a plain box of cornflakes and add a small amount of brown sugar. Despite my reluctance to try the pumpkin spice Tony the Tiger approved flakes, my stubbornness won out. I immediately regretted the decision once the box was opened. The terror I was anticipating hit my nose with a fierceness. It’s everything terrible and fake that comes with the scent of pumpkin spice things. Concentrated, sharp, manufactured. It’s like injecting pumpkin spice wax into your nostrils. I prepared for the worst in the taste department but that expected awfulness never materialized. The smell is betraying as the taste isn’t that far off from frosted flakes. There’s a hint of the pumpkin spice, and yes, all the sweet melds into the milk in an unholy beverage with an even unholier colour with flecks of spice that are as scary as you can imagine, but you know? Eating the cereal is almost like eating a regular bowl of frosted flakes. 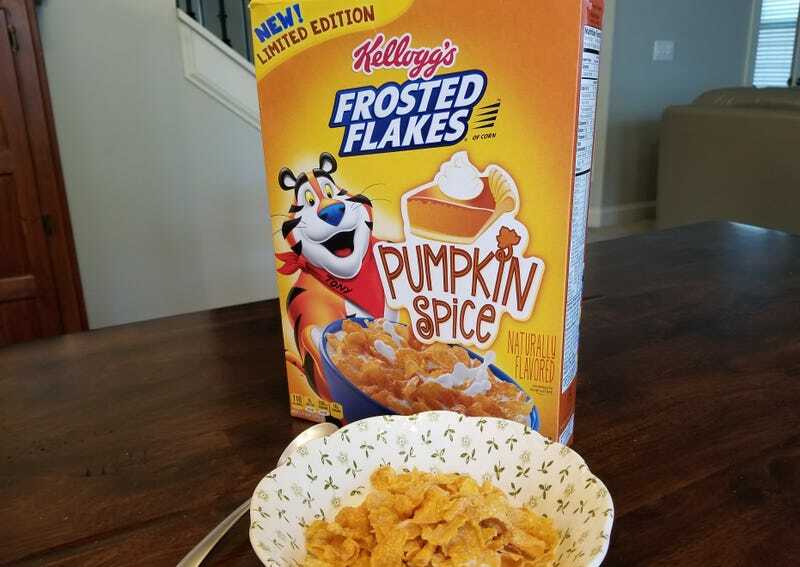 The tainted childhood memories are there with all the trappings of knowing what to expect with frosted flakes, poisoned ever-so-slightly by a twinge of pumpkin spice. That’s not right. The flecks of spice should worry you. After the set up of the scent, the rest comes as a surprise. Dare I say a nice one? At least, one I didn’t mind but don’t really have a need to repeat with a second box. It’s still not awesome, mind you. But it’s not anything extraordinarily different from the norm. There are lots of terrible pumpkin spice flavored products vying for your attention out there. Pumpkin Spice Frosted Flakes is another but I’m here to tell you that I tried it so you wouldn’t have to, but maybe you should. I didn’t think this would be the outcome proving that 2018 is truly a special kind of hell we’re living in.